Former Navy SEAL Sebastian "Bash" Lockard died in Afghanistan after leaping on a grenade to save his comrades. Little did he know his act of heroism would grant him a ticket into Heaven's elite army as one of the few and powerful Archangels. Struggling with his new existence, Bash still retains his human memories, leaving behind a wife he loves with all of his heart. Although he's forbidden to see her, he can't resist her lure, or the mortal desires he harbors for her. As a young widow and nurse, Irene Lockard still mourns her husband two years after his untimely death. His absence is everywhere, and when her best friend weds, she hits an emotional rock bottom. As if summoned from the skies above, Sebastian appears before her, and they share an unforgettable night. But when he once again vanishes, she wonders if she's truly gone mad with grief. 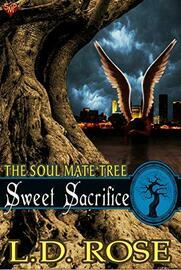 A standalone paranormal romance in The Soul Mate Tree Series.